^ Yoshi (bottom-left) is excluded in German copies because of a USK label. ^ Pokémon Trainer, who uses three summonable Pokémon (Squirtle, Ivysaur, and Charizard), Popo and Nana of the Ice Climbers, and Rosalina and Luma are each considered singular characters in the playable character total. ^ The Duck Hunt dog and duck generally act as a single fighter and are considered one character in the playable character total. ^ Reseigh-Lincoln, Dom (June 22, 2018). "Random: Yoshi Gets Cut From The German Box Art For Super Smash Bros. Ultimate". Nintendo Life. Retrieved December 7, 2018. ^ "E3 2018: Get your first look at Super Smash Bros. Ultimate". CNET. June 12, 2018. Retrieved June 12, 2018. ^ Martinez, Philip (August 8, 2018). "Simon Belmont, King K. Rool And More Details From 'Super Smash Bros. Ultimate' Direct". Newsweek. Retrieved August 8, 2018. ^ a b "Super Smash Bros. Ultimate will feature every single character from the series' history". The Verge. Archived from the original on June 14, 2018. Retrieved June 12, 2018. ^ a b "Super Smash Bros. Ultimate brings back every Smash fighter ever". Polygon. Archived from the original on June 14, 2018. Retrieved June 12, 2018. ^ a b c Bailey, Kat (June 13, 2018). "Nintendo on Whether Smash Bros. Ultimate is Just a Wii U Update: "It's Built From the Ground Up"". USGamer. Archived from the original on June 14, 2018. Retrieved June 13, 2018. ^ Gilliam, Ryan (June 12, 2018). "Metroid's Ridley will be playable in Super Smash Bros. Ultimate". Archived from the original on June 12, 2018. Retrieved June 12, 2018. ^ a b c "New details for 'Super Smash Bros.' on Switch were revealed at E3 2018". Newsweek. June 12, 2018. Archived from the original on June 12, 2018. Retrieved June 12, 2018. ^ Kuchera, Ben (August 8, 2018). "Super Smash Bros. Ultimate will include 103 stages, stage morph feature". Polygon. Retrieved August 8, 2018. ^ Radulovic, Petrana (August 8, 2018). "Super Smash Bros. Ultimate features some new gameplay modes". Polygon. Retrieved August 8, 2018. ^ Nunneley, Stepheney (June 12, 2018). "E3 2018: Super Smash Bros. Ultimate roster includes every character from previous games – out December 7". VG247. Archived from the original on June 14, 2018. Retrieved June 13, 2018. ^ a b c Frank, Allegra (November 1, 2018). "Super Smash Bros. Ultimate's Spirits Mode adds tons more characters to the game". Polygon. Retrieved November 1, 2018. ^ Gartenburg, Chaim (November 19, 2018). "Super Smash Bros. Ultimate's single-player mode shines on the Switch". The Verge. Retrieved November 19, 2018. ^ Carter, Chris (November 1, 2018). "Super Smash Bros. Ultimate has a new 'World of Light' adventure mode, SubSpace Emissary will not return". Destructoid. Retrieved November 1, 2018. ^ Carter, Chris (December 2, 2018). "Super Smash Bros. director says there's a practical reason why Kirby survived the apocalypse in the last trailer". Destructoid. Retrieved December 6, 2018. ^ a b c d Marks, Tom (December 6, 2018). "Super Smash Bros Ultimate Review". IGN. Retrieved December 6, 2018. ^ Gartenberg, Chaim. "Super Smash Bros. Ultimate will support GameCube controllers". The Verge. Archived from the original on June 14, 2018. ^ McWhertor, Michael (June 12, 2018). "Super Smash Bros. Ultimate will support GameCube controllers, amiibo". Polygon. Archived from the original on June 12, 2018. Retrieved June 12, 2018. ^ Osborn, Alex (June 12, 2018). "E3 2018: Super Smash Bros. Ultimate Ridley, Inkling Amiibo Announced". IGN. Archived from the original on June 15, 2018. Retrieved June 14, 2018. ^ Webster, Andrew (November 1, 2018). "Super Smash Bros. Ultimate is getting its own dedicated video sharing service". The Verge. Retrieved November 1, 2018. ^ Hussain, Tamoor (August 8, 2018). "Super Smash Bros. Ultimate Soundtrack Has Over 800 Songs". GameSpot. Retrieved August 8, 2018. ^ a b Makuch, Eddie (April 16, 2019). "Smash Bros. Ultimate 3.0 Update Adds Stage-Builder, Video Editor, Persona 5 Character, More". GameSpot. Retrieved April 16, 2019. ^ Donaldson, Alex (November 28, 2018). 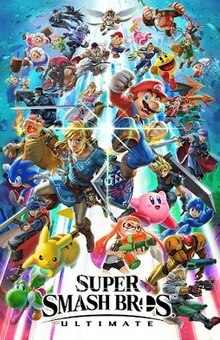 "Smash Bros Ultimate character roster: all fighters, stages and DLC for Smash on Switch". VG247. Retrieved December 22, 2018. ^ Frank, Allegra (June 12, 2018). "Super Smash Bros. Ultimate brings back every Smash fighter ever". Polygon. Archived from the original on June 14, 2018. Retrieved June 12, 2018. ^ Knezevic, Kevin (August 8, 2018). "Super Smash Bros. Ultimate Gets Chrom And Dark Samus As Echo Fighters, Here's How They Work". GameSpot. Retrieved August 8, 2018. ^ a b c D'Anastasio, Cecilia (June 12, 2018). "Everything We Know About Super Smash Bros. Ultimate". Kotaku. Archived from the original on June 12, 2018. Retrieved June 12, 2018. ^ a b c d e f Webster, Andrew (June 12, 2018). "Why Super Smash Bros. Ultimate was such a daunting game for its creators to build". The Verge. Archived from the original on June 12, 2018. Retrieved June 12, 2018. ^ Kim, Matt (January 29, 2019). "Piranha Plant is Now Playable in Super Smash Bros. Ultimate". USGamer. Retrieved January 29, 2019. ^ "Piranha Plant Coming to Smash Ultimate Around February, Not Part of Fighters Pass". Kotaku UK. Retrieved December 7, 2018. ^ Patches, Matt (November 1, 2018). "Super Smash Bros. DLC will add 5 characters to the roster". Polygon. Retrieved November 1, 2018. ^ "Here's Our Thoughts on Everything That Happened During The Smash Bros. Ultimate Direct". Kotaku UK. Retrieved December 7, 2018. ^ a b "Smash is Special – Part 2". Famitsu (Interview with Masahiro Sakurai) (in Japanese). Japan (558). June 28, 2018. ^ a b c d "Smash is Special – Part 1". Famitsu (Interview with Masahiro Sakurai) (in Japanese). Japan (557). June 21, 2018. ^ a b c d e Wong, Alistar (December 15, 2018). "Smash Bros. Ultimate Director Sakurai Talks About How The Game Isn't Just "Nintendo All-Stars" Anymore". Siliconera. Retrieved December 21, 2018. ^ a b c Bowling, Steve (July 14, 2018). "Feature: Talking Super Smash Bros. Ultimate With Nintendo's Bill Trinen And Nate Bihldorff". Nintendo Life. Retrieved September 20, 2018. ^ "はてな、Nintendo Switchソフト「大乱闘スマッシュブラザーズ SPECIAL」の一部機能の開発に協力". Hatenacorp.jp (in Japanese). Retrieved December 7, 2018. ^ a b c Santagelo, Nick (November 21, 2018). "Super Smash Bros. Director Talks Character Process and Development". IGN. Retrieved December 23, 2018. ^ "David Hayter Is Voicing Snake For His Return In Super Smash Bros. Ultimate - Game Informer". Game Informer. Archived from the original on June 12, 2018. Retrieved June 12, 2018. ^ Grayson, Nathan (September 15, 2014). "Why Super Smash Bros Players Are So Obsessed With Ridley". Kotaku. Archived from the original on June 19, 2018. Retrieved June 23, 2018. ^ Shea, Brian (November 21, 2018). "Masahiro Sakurai Talks Piranha Plant, Spirits, And 20 Years Of Super Smash Bros". Game Informer. Retrieved December 23, 2018. ^ Khan, Imran. "Have You Been Listening To The Super Smash Bros. Ultimate Music Samples?". Game Informer. Retrieved September 19, 2018. ^ a b c Wong, Alistair. "Masahiro Sakurai On The Process Of Including Music In Smash Bros. Ultimate". Siliconera. Retrieved September 19, 2018. ^ Sounders, Mike. "Check out all the new music from yesterday's Super Smash Bros. Ultimate Direct". Destructoid. Retrieved November 26, 2018. ^ McWhertor, Michael (November 7, 2018). "Super Smash Bros. Ultimate DLC lineup has already been decided". Polygon. Retrieved November 7, 2018. ^ Goldfarb, Andrew (December 7, 2018). "Nintendo: Persona 5's Joker is 'Emblematic' of Smash Bros. Ultimate's DLC Approach". IGN. Retrieved December 10, 2018. ^ Craddock, Ryan (July 17, 2018). "Super Smash Bros. Ultimate Will Be Playable At San Diego Comic-Con This Week". Nintendo Life. Retrieved November 1, 2018. ^ Foxx, Chris (June 13, 2018). "E3: Nintendo's Super Smash Bros Ultimate battle-tested". BBC. Retrieved November 1, 2018. ^ "Best of E3 2018 Awards". IGN. June 15, 2018. Retrieved November 24, 2018. ^ "Gamescom 2018 award winners include Marvel's Spider-Man, Super Smash Bros. Ultimate". CNET. August 22, 2018. Retrieved November 24, 2018. ^ Goslen, Austen (November 1, 2018). "Top 5 reveals from today's Super Smash Bros. Ultimate Nintendo Direct". Polygon. Retrieved November 1, 2018. ^ Kuchera, Ben (August 8, 2018). "Super Smash Bros. Direct: Watch it here". Polygon. Retrieved November 1, 2018. ^ "Super Smash Bros. Ultimate is getting a limited edition Pro controller". Polygon. Retrieved August 28, 2018. ^ G. Macy, Seth (September 18, 2018). "Here Are All the Nintendo Switch Bundles Coming Out This Year". IGN. Retrieved September 19, 2018. ^ Lawler, Richard. "Switch 'Super Smash Bros. Ultimate' set bundles system and game for $360". Engadget. Retrieved October 16, 2018. ^ "GameCube Controllers Will Be Compatible With Super Smash Bros. Ultimate". Nintendo Life. Retrieved October 29, 2018. ^ "Nintendo to remove Native American references in Super Smash Bros. Ultimate". Eurogamer. November 7, 2018. Retrieved November 7, 2018. ^ Frank, Allegra (November 27, 2018). "Why Super Smash Bros. fans can't stand 'disrespectful' spoilers". Polygon. Retrieved November 28, 2018. ^ a b "Super Smash Bros. Ultimate for Switch Reviews". Metacritic. Retrieved January 17, 2019. ^ Carter, Chris (December 6, 2018). "Review: Super Smash Bros Ultimate". Destructoid. Retrieved December 6, 2018. ^ "Super Smash Bros. Ultimate". Edge. No. 327. Future plc. December 6, 2018. pp. 102–103. ISSN 1350-1593. ^ Slead, Evan (December 6, 2018). "Super Smash Bros. Ultimate review". EGM. Retrieved December 7, 2018. ^ "Super Smash Bros. Ultimate review - a messy, magical festival of video games". Eurogamer. Retrieved December 12, 2018. ^ Romano, Sal (December 18, 2018). "Famitsu Review Scores: Issue 1568". Gematsu. Retrieved December 18, 2018. ^ Cork, Jeff (December 7, 2018). "Super Smash Bros. Ultimate Review". Game Informer. Retrieved December 10, 2018. ^ Cherdchupan, Michael (December 10, 2018). "Super Smash Bros. Ultimate im Test - Geniales Prügelfestival mit einem Online-Tiefschlag". GamePro. Retrieved December 14, 2018. ^ Garst, Aron (December 6, 2018). "Super Smash Bros Ultimate Review". GamesRadar. Retrieved December 6, 2018. ^ Tran, Edmond (December 6, 2018). "Super Smash Bros Ultimate Review". GameSpot. Retrieved December 6, 2018. ^ a b Anagund; Epyon (December 6, 2018). "Test : Super Smash Bros. Ultimate : Le meilleur épisode de la série". Webedia. Retrieved December 6, 2018. ^ Olney, Alex (December 6, 2018). "Super Smash Bros. Ultimate Review". Nintendo Life. Retrieved December 7, 2018. ^ Bailey, Kat (December 7, 2018). "Super Smash Bros. Ultimate Review". USgamer. Retrieved December 7, 2018. ^ Knezevic, Kevin (December 7, 2018). "Smash Bros. Ultimate Reviews Roundup". Gamespot.com. Retrieved December 7, 2018. ^ Frank, Allegra (December 11, 2018). "Super Smash Bros. Ultimate's online modes are turning players away". Polygon. Retrieved December 11, 2018. ^ D'Anastasio, Cecilia (December 10, 2018). "Super Smash Bros. Still Can't Get Online Right". GameSpot. Retrieved December 10, 2018. ^ Craddock, Ryan (November 23, 2018). "Super Smash Bros. Ultimate Is The Best Pre-Selling Game Of The Series To Date, And On Switch". Nintendo Life. Retrieved November 24, 2018. ^ Dring, Christopher (December 9, 2018). "UK Charts: Super Smash Bros Ultimate is the fastest-selling Smash Bros of all time". Gameindustry.biz. Retrieved December 9, 2018. ^ Doolan, Liam (December 11, 2018). "Smash Bros. Ultimate Sold 1.2 Million Copies In Japan During Launch Week". Nintendo Life. Retrieved December 12, 2018. ^ Arif, Shabana (December 18, 2018). "Super Smash Bros. Ultimate is the fastest-selling Nintendo home console game of all time in Europe". VG247. Retrieved December 18, 2018. ^ Kerr, Chris (December 20, 2018). "Smash Bros. Ultimate worldwide sales topped 5M in first week". Gamasutra. Retrieved December 20, 2018. ^ Craddock, Ryan (December 24, 2018). "UK Charts: Super Smash Bros. Ultimate Overtakes Splatoon 2 Lifetime Sales In UK". Nintendo Life. Retrieved December 24, 2018. ^ -Workman, Robert (January 1, 2019). "'Super Smash Bros. Ultimate' Tops Amazon's Best-Selling Games List For 2018". Comicbook.com. Retrieved January 2, 2019. ^ Nakamura, Yuji (January 31, 2019). "Nintendo Tops Profit Estimates, Cuts Switch Shipments Target". Bloomberg L.P. Retrieved January 31, 2019. ^ Arif, Shabana (January 31, 2019). "Super Smash Bros. Ultimate is the fastest selling Nintendo game ever". VG247. Retrieved January 31, 2019. ^ "IGN'S Best of 2018". IGN. December 10, 2018. Retrieved January 13, 2019. ^ Watts, Steve (July 5, 2018). "Resident Evil 2 Wins Top Honor In E3 Game Critics Awards". GameSpot. Retrieved January 5, 2019. ^ Keane, Sean (August 22, 2018). "Gamescom 2018 award winners include Marvel's Spider-Man, Super Smash Bros. Ultimate". CNET. Retrieved January 5, 2019. ^ Hoggins, Tom (September 24, 2018). "Golden Joysticks 2018 nominees announced, voting open now". The Daily Telegraph. Retrieved January 5, 2019. ^ Keyes, Rob (January 3, 2019). "2018 New York Game Awards Nominees Revealed". Screen Rant. Retrieved January 5, 2019. ^ Fogel, Stefanie (March 21, 2019). "'God of War' Wins Six G.A.N.G. Awards, Including Audio of the Year". Variety. Retrieved March 22, 2019. ^ "【速報】ファミ通アワード2018 ゲーム・オブ・ザ・イヤーは『モンスターハンター：ワールド』と『大乱闘スマッシュブラザーズ SPECIAL』がダブル受賞！（大賞受賞画像・コメント追加）". Famitsu. April 5, 2019. Retrieved April 5, 2019.